Companies from China and Japan inked over 50 deals on Friday for cooperation in areas like infrastructure and services to further develop third-party markets. The agreements also cover digital technology, healthcare, finance, regional development and manufacturing, according to officials from both sides. The two sides have already begun to work with the Thai government on a high-speed railway project in the eastern part of Thailand, as well as smart city projects. As the two major manufacturing powerhouses and investors for outbound direct investment, China and Japan certainly can find more growth potential to develop markets in different parts of Asia, Africa and Latin America to meet their rising demand for industrialization and urbanization, said He Lifeng, chairman of the National Development and Reform Commission. "The governments from both sides will take a number of measures to ensure that business operations in host countries will be economical and sustainably beneficial," said He. Hiroshige Seko, the economy, trade and industry minister of Japan, said the joint development of third-party markets will boost the efficiency of the industrial structure in China and Japan, and the construction ability in related markets. For the next step, China and Japan will together explore priority areas and sectors in certain third-party markets, as well as establishing multi-party platforms to guide more companies from both countries to invest in these markets, according to officials. Commerce Minister Zhong Shan suggested that such projects can start from countries that are close to China and Japan, especially in areas like logistics, environment protection and emerging industries. The surging two-way goods volume transported by China-Europe freight train services is also an ideal option for Japanese companies to export their products to Europe and other third-party markets. 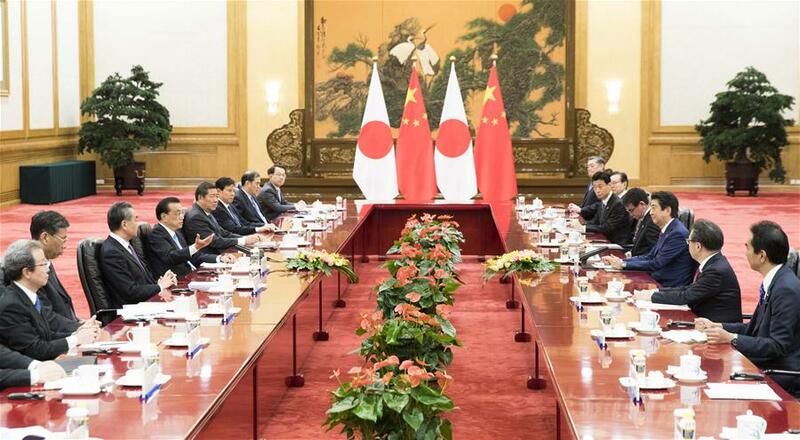 Analysts said the enhanced bilateral collaboration offers a chance for the Japanese side to participate in the Belt and Road Initiative and is conducive to the further development of bilateral business ties, as the agreements were signed in Beijing during Japanese Prime Minister Shinzo Abe's official visit to China from Thursday to Saturday. "Confronting the growing trend toward unilateralism and protectionism, developing third-party markets will not only conform to mutual interests but also benefit the global economy," said Li Yong, vice-chair of the expert committee at the China Association of International Trade. Thanks to the improved bilateral ties, trade between China and Japan surged 10.7 percent year-on-year to $243.71 billion in the first three quarters of this year, data from the General Administration of Customs showed. China saw foreign direct investment inflows edge up 2.9 percent year-on-year to 636.7 billion yuan ($91.67 billion) in the first nine months of this year, while companies from Japan, South Korea and the United Kingdom remained the main investors in China's high-end manufacturing and service sectors, data from the Ministry of Commerce showed.